Tomorrow Microsoft is launching Office 365. Many of you have asked for our perspective, so we thought we’d share some thoughts to help you make an informed choice. Technology inevitably gets more complicated as it gets older. Upgrading platforms and adding features results in systems that are increasingly difficult to manage and complex to use. At times like these, it's worth considering a clean-slate: an approach based on entirely modern technologies, designed for today’s world. Office 365 is for individuals. Apps is for teams. Most of us no longer spend our days working on our own. We work with others: creating, collaborating, sharing. worry about whether or not it’s possible to share a spreadsheet, or co-edit a presentation. You can see people type in real time, and share a file in just two clicks. Discussions bring people into your documents for rich conversations. You don’t need to buy additional licenses to work with others, or hope people outside your company have upgraded to the same software. If you have a Google account, you can collaborate. “We’ve shaved eight weeks off of the end-to-end budgeting process using Google Docs, which translates into close to 30% time savings,” said Michael Rodger, Delta’s Director of Digital Innovation. Office 365 is built for Microsoft. Apps is built for choice. Office 365 is optimized for Windows-based PCs and devices, which reduces your flexibility. Our applications are designed to work well on any device, on any operating system. Desktop, laptop, Chromebook, tablet, smartphone. Windows, Mac, Linux, Android, Blackberry, iOS, Windows Mobile. Edit on the go. Share from anywhere. Start on your computer, move to your tablet, finish on your phone. When the web is the platform, it just works. “The initial reason we looked at Google Apps was cost savings, but the on-going value of access to information from anywhere totally independent of the device is where we're seeing the real gain,” said Scot Adams, the CIO of Cadillac Fairview. 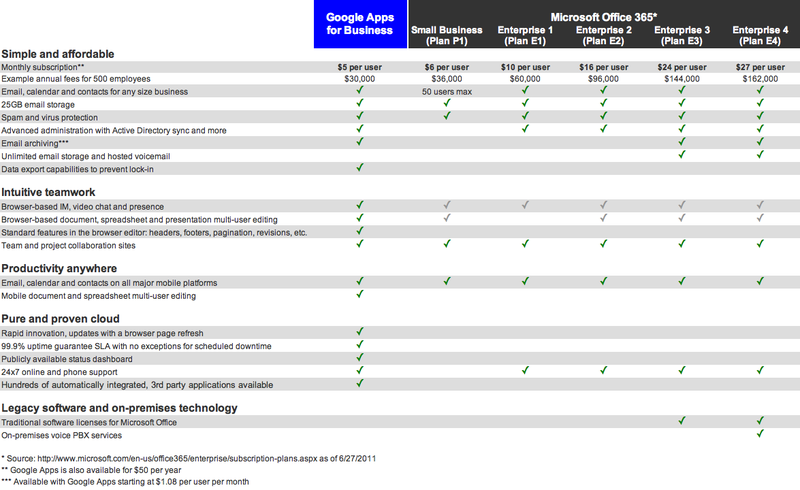 Office 365 is 11 different plans, 3 editions and 2 tiers. Apps is $5/month with no commitment. We have a single, transparent, low price that meets everyone’s needs, and it hasn’t changed in 4 years. There’s no extras for basics like phone support and robust productivity apps. No long term contracts or opaque enterprise agreements. We also don’t lock you in. By design, we make it as easy as possible for you to move off of Google Apps if you want. We have a dedicated team of engineers whose sole goal is to help you get your data in and out of our products for free. We believe that the way to keep you long term is to continue to innovate and make our products better so that you choose to stay with us. Office 365 is about the desktop. Apps is about the web. 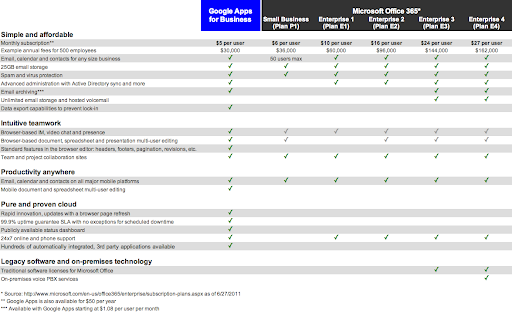 Google Apps are accessed in a browser. There’s no client software to install, secure and maintain. Upgrades and years of patience aren’t necessary to get access to the latest innovation, just click refresh. Our customers received more than 125 new features in the last year alone. Running a reliable and secure cloud-based service is challenging and requires you to rethink everything. This year Gmail has been available 99.99 percent of the time, which translates to less than 5 minutes of downtime per month. That includes all downtime, planned and unplanned, of any duration, for any and all users. We make zero exceptions when calculating our uptime, and we’re transparent with you in the rare cases when things go wrong. You can't just take legacy, desktop software, move some of it to a data center and call it "cloud." Apps was born for the web and we've been serving hundreds of millions of users for years. Ok, we didn’t get to all 365 reasons here today, but we hope we gave you some things to think about. Ultimately, we have a fundamentally different vision for the future of software. That’s good, because it provides a clear choice. Before you invest ten years in the past, we’d humbly encourage you to invest ten minutes in today by checking out why so many businesses have chosen Google Apps. Apps isn’t for everyone. But in the last week alone 38,000 businesses decided to give it a try. Maybe you should too.